White or dark blue rain barrels don't work for you? Maybe you'd prefer a color that makes a statement. Perhaps you'd like the barrel to disappear into its surroundings? Krylon® Fusion Spray Paint for Plastic® is the answer. The line up of 35 colors includes satin and gloss to choose from! It took two cans of spray paint to get good coverage and 3 would be better. Camouflage paint job. A branch was used as a stencil to get this effect. You CAN do this. To see how this was done, go HERE. 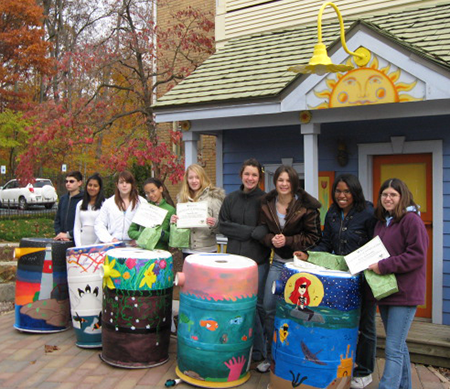 Barrel art contest winners from BSU - Burris Laboratory School, Muncie IN - they are standing in front of a garden house at Minnetrista Cultural Center where the winning barrels will be installed around the Cultural Center Campus. 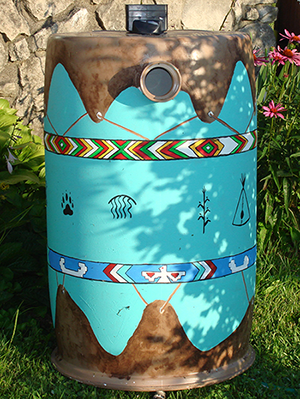 To see more barrels painted by these artists go here. 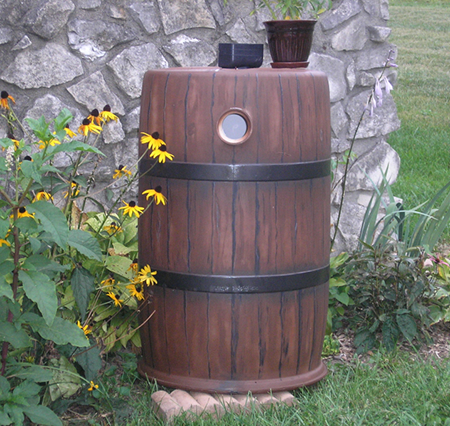 Real whiskey barrel? Only a close up inspection can tell the difference. Aquabarrel® prides itself on being an environmentally friendly company. We offer this link because we understand that our customers demand choices and alternatives. 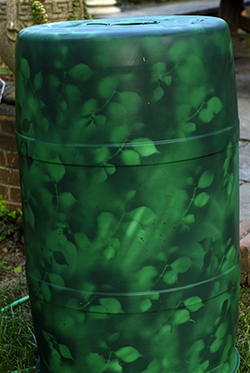 As a company policy we do not paint or UV treat the rain barrels we offer. Will this change its life span? Perhaps. But what is worse for the environment? A barrel headed to the plastic recycler early or releasing toxins into the atmosphere? So we provide you with the options and ask that you consider what we have struggled with in bringing you this fine product. 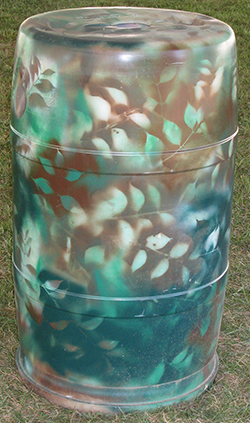 If you want to use outdoor acrylics to paint your rain barrel you need to prime and top coat your plastic barrel. Clean the exterior surface with a 1:1 mixture of vinegar and water. Apply at least one coat of outdoor primer. Primer must be allowed to dry per manufacture’s instructions. Paint barrel and allow the paint to dry completely. Apply two coats of polyurethane. Allow the polyurethane to dry between coats.